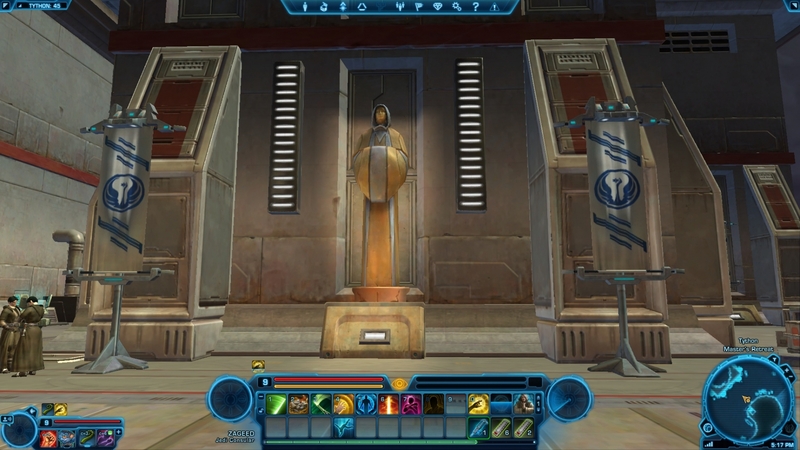 Welcome to DDM’s Jedi Knight and Sith Warrior beginning class guides for Star Wars The Old Republic (TOR). Why am I discussing Jedi Knights and Sith Warriors together? The answer is simple: mechanically speaking, they are played almost exactly the same, have the same powers, and fill the same roles in a group. The two have vastly different storylines and completely different goals, but when you boil down the nitty gritty of each class, they are very similar. You will see what I mean soon enough. These class guides will be focused around the mechanics and play style that each class fits into. The Jedi Knight and Sith Warrior play the same roles, work the same way, use the same powers, and seek the same equipment. Do you want to play a character that likes to jump into the fray, takes damage and deals it out, and is the last one to leave a fight? 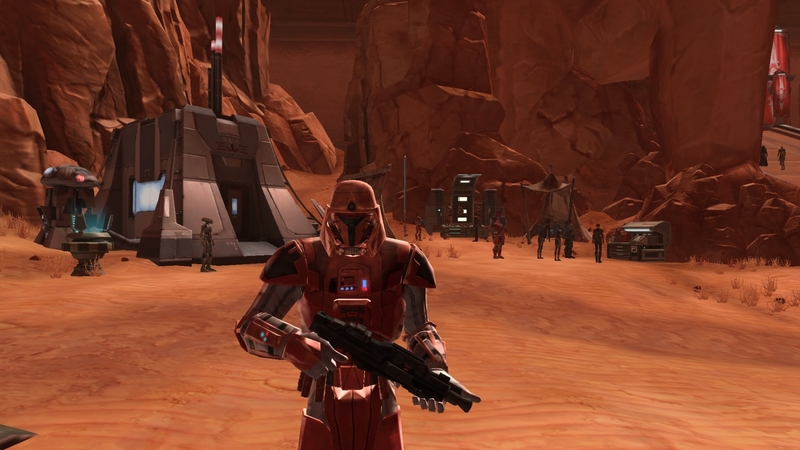 Whether you want to fight for the Republic or scheme through the Empire, these classes might be right for you in TOR. Leaders and warriors, heroes and champions, the Jedi Knights have stood at the forefront of every battle. They are masters of the lightsaber arts, kicking, jumping, and flashing through the air, using the Force to clear the way in front of them. 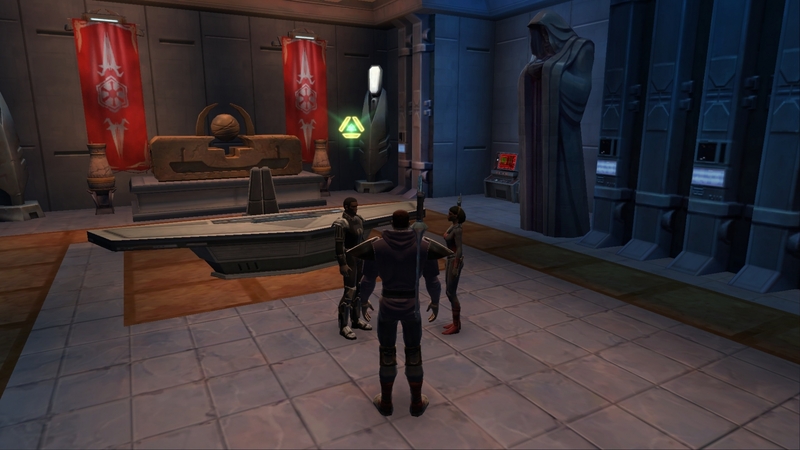 Jedi Knights can be: Human, Miraluka, Mirialan, Twi’lek or Zabrak. No one inspires more fear than a Sith Warrior. Born for battle, few opponents can withstand the rage-fueled blows from a warrior’s lightsaber or penetrate a warrior’s armor. 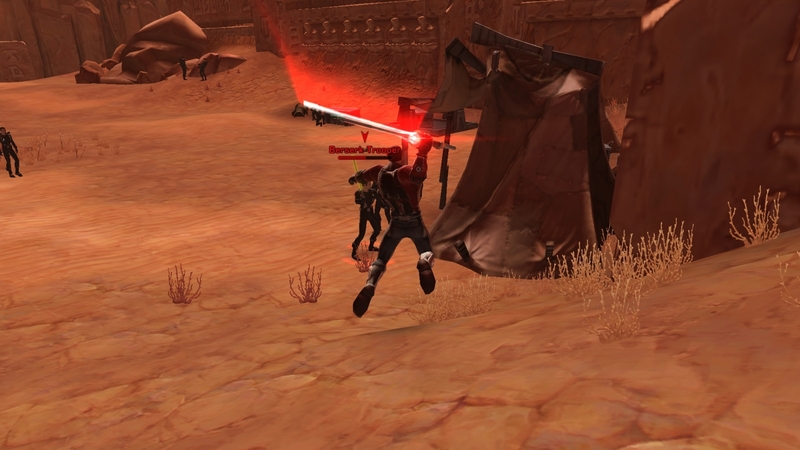 If dual wielded lightsabers can’t finish the job, there is always Force Choke to bring an opponent to his knees. This class is considered the tank or upfront class in TOR. There are a couple of different class paths you can take later to fine tune the role you like best, but for now, we are going to stick with the basic up front tank role. What does being a tank mean? That means you should be in front of the group. You should lead the group through dangerous territory so you are the first one to be attacked. You will have the armor and hit points to take the damage where others in your group might not. 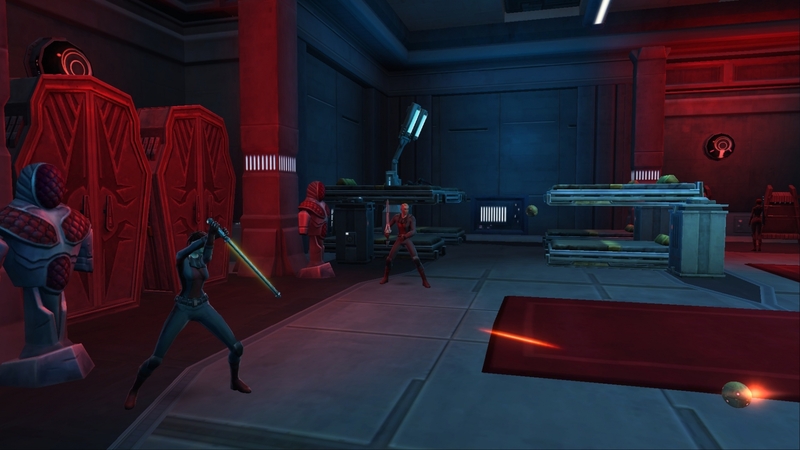 You will need to be face to face with the enemy, slashing it apart with the lightsaber while augmenting your fighting through the force. Your job will be to keep the enemy’s attention while the other classes assist you in the battle. You should always be the first one into the battle. You will notice three abilities that are far higher than the others. Strength will determine your damage in melee. Presence will help with your agro (aggression) generation. Endurance will determine how many hit points you have and how much damage you can absorb. These abilities should be your primary focus. Try to equip items and gear that increase Strength, Presence, and Endurance. These classes can use light and medium armor. Light armor will have less of a bonus than medium armor. However, be sure to check the particular item’s statistics. Mouse over the item and the information will pop up. Quality light armor is often better than standard medium armor. Good changes will show as green and poor changes will show as red. Though it is nice to boost up your primary abilities, look closely at the armor rating. Tanks need to be able to take damage before they can deal it out and the armor rating should be your first priority. It should come as no surprise that both of these classes use lightsabers. That will be your primary weapon through much of your career. There are several other weapons available, such as vibroswords, in TOR. There may be times when you are lucky and get a vibro weapon that is better than the current lightsaber you have. Don’t automatically dismiss anything that isn’t a lightsaber, you may just be missing out on something nice. 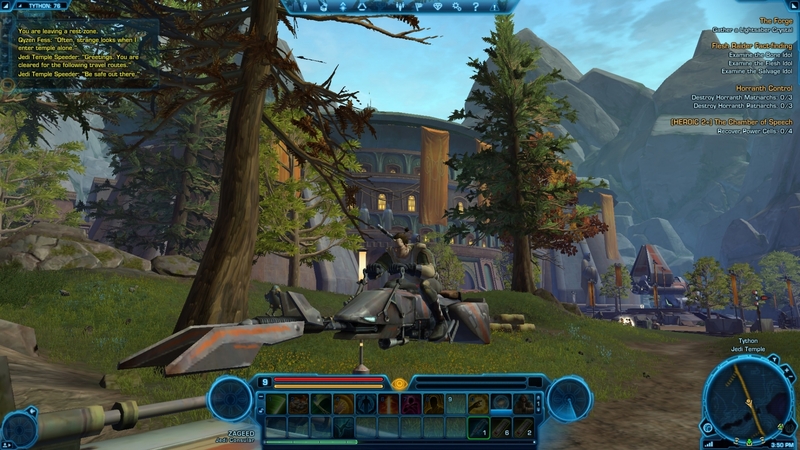 Your lightsaber is going to be the first weapon you are able to upgrade and modify. Try to stay on top of this to make sure your lightsaber is as good as it can be. Watch for quest rewards, drops, and most especially good crafters that can create these modifications for you. They might be a bit expensive, but they’ll be well worth it when you are tearing through swarms of enemies! 1 Strike Assault Instant 4m Melee Damage Inflicts damage with a series of quick melee attacks. Generates 2 Focus/Rage. Strikes with both weapons if dual wielding. 1 Slash Vicious Slash Instant 3 4m Melee Damage Slashes the target for lots of damage. Attacks with both weapons if dual wielding. 1 Shoo-cho Form Shoo-cho Form Instant 1.5s Self-Buff Enters a balanced lightsaber form, increasing all damage dealt and reducing all damage received by 3%. 1 Force Might Unnatural Might Instant 6s 30m AE Buff Increases the target’s melee, ranged, Force and tech bonus damage and healing by 5% for 60 minutes. If the target is a party member, all other party members are also affected. 1 Quick Travel Quick Travel 6s 1800s Takes you to a discovered bind point of your choosing. Not usable in combat. 1 Introspection Channel Hatred 15s Self-Heal Pause and reflect to restore your health. Entering combat or taking damage cancels this ability. Cannot be used during combat. 2 Force Leap Force Charge Instant 15s 10m-30m Melee Damage Jumps to a distant target, dealing damage with the main hand weapon, immobilizing the target for 2.0 seconds and interrupting the target’s current action. Builds 3 Focus/Rage. Cannot be used against targets in cover. 3 Force Sweep Smash Instant 3 15s 5m AE Melee Damage Strikes up to 5 enemies within 5 meters with the Force, dealing kinetic damage. Also stuns weak and standard enemies for 1.5 seconds. 4 Saber Ward Saber Ward Instant 180s Buff Raises a lightsaber ward, increasing melee and ranged defense by 50% and reducing the damage taken from Force and tech attacks by 25%. Lasts 12 seconds. 5 Riposte Retaliation Instant 3 6s 4m Melee Damage Ripostes/Retaliation strikes back at the target for weapon damage. Riposte can only be used after a successful melee or ranged defense and does not respect the global cool down. Attacks with both weapons if dual wielding. Cannot miss, be parried or dodged. 6 Blade Swarm Force Scream Instant 4 12s 10m AE Melee Damage Uses the Force to project a wave of energy toward the target, dealing kinetic damage. In addition, standard and weak enemies are knocked senseless, stunned for 4 seconds. 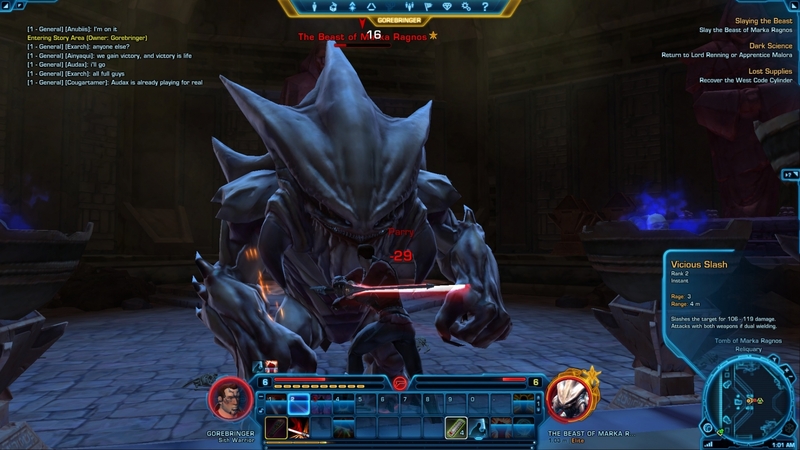 8 Master Strike Ravage Channeled 3s 30s 4m Melee Damage Performs a series of lightsaber attacks that deals a lot of weapon damage over 3 seconds. Standard and weak enemies are additionally stunned for the duration of the effect. Strikes with both weapons if dual wielding. 9 Resolute Unleash Instant 120s Self-Buff Breaks you free from all incapacitating and movement-impairing effects. Level: The level you are able to train this ability. Name: The name of the ability. Cost: How much Focus/Rage it takes to use this ability. Activate: How long it takes to begin. Instant means right away. Channeled means it is used for the time duration listed. A time listed means it takes that long to begin the action. Both timed and channeled actions can be interrupted. Cool Down: How long you will have to wait before you can use this ability again. Seconds are abbreviated as (s). Range: This is the distance you must be within to use this ability. Some abilities are used up close while others can be used from afar. Meter is abbreviated as (m). Type: The kind of ability, if it helps you and your friends or harms your enemy. AE means Area of Effect, which will hit multiple targets. Description: A detailed description of the ability. Both of these classes are excellent classes for battle, since fighting is what they are meant to do. You will have to suffer through a few low levels consisting of running up to your enemies and smacking them on the nose. But once you get Force Leap/Force Charge, you will really feel yourself come into the role of the front line fighter. 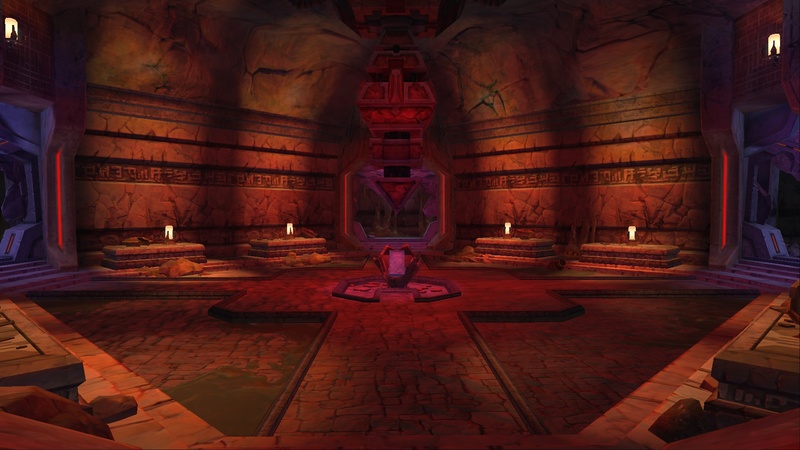 There is a lot of solo content in TOR, especially as you work your way through your class quest. Soloing means playing through content by yourself. If you are fighting a group of enemies, you can use your abilities however you choose. I would suggest experimenting in order to familiarize yourself with your abilities so you can easily decide in combat what you need to use and the results to expect. However, for most general playing in the game you will want to use the class’s one-two punch. Use the Tab key to cycle through the group and figure out if there is one that is the strongest. Select the strongest one, but if they are all similar in power, pick the one in the middle of the group of enemies. Force Leap/Force Charge in, using your basic Strike/Assault to finish off the first MoB. As the enemy’s allies move in, use Force Sweep/Smash to damage and scatter your enemies. Finish the remaining enemies off with Strike/Assault as they get up. You’ll want to use different tactics when you are fighting a single tough enemy, such as in boss fights. The one-two punch tactic may not work as well. This will be your first training for tanking in Flashpoints and Raids, so take it seriously and learn the tricks to fighting well here so you can be an awesome tank later in the game. It might be tempting to use Force Leap/Force Charge to start, but I would suggest saving it unless you know all of the special abilities of the boss you are about to fight. You might use Force Leap instead to recover if and when you are knocked back or thrown around. Many boss mobs will fling you away; it’s nice to have this ability ready to jump back into the fray. It also might be tempting to use Force Sweep/Smash to toss the enemy around. Though fun, this ability is much better used to interrupt a powerful or boss creature’s special devastating attack. They all have tells, so watch for them. As soon as you see the tell use Force Sweep/Smash to interrupt the attack. Through most of the battle you will want to use Strike/Assault to build up your resource bar so you can use your other abilities. Don’t use up your resources right away—you need to build enough to be able to use Riposte/Retaliation. This is a great boss fight ability that can only be used during certain circumstances. The important thing is it can be used outside of the global cool down, so you may be able to use it while all of your other abilities are in the cool down cycle. If you keep enough resources to always be able to use this technique, along with fitting in as many Slash/Vicious Slashes as possible, you will tear through even the meanest bosses. Use Strike/Assault to build up your resources. You need enough to use Reposte/Retaliation and Slash/Vicious Slash. Use a combination of Strike/Assault and Slash/Vicious Slash. When Reposte/Retaliation lights up, use it immediately. Use Force Sweep/Smash to interrupt the big nasty attacks. Use Force Leap/Force Charge when you miss the interrupt and are tossed aside. When you are grouped with others, the MoBs should drop pretty quickly, so there shouldn’t be much need to use a lot of different abilities. Force Leap/Force Charge gets you into the fray and keeps your enemies from charging down the ranged characters. Strike/Assault keeps your resources high. Slash/Vicious Slash deals lots of damage quickly to standard MoBs. When you’re in a group, it is generally frowned upon to use Force Sweep/Smash, since knocking the enemies around is far more annoying than helpful. Your group mates will miss their attacks, waste resources, and spend time chasing MoBs around. This wastes time and is frustrating. If you need to hit many enemies at once, use Blade Swarm/Force Scream instead. This will do damage and build your agro, but it won’t knock them around. Your party members will thank you… well… at least they won’t curse you! Grouping and fighting bosses works similarly to solo boss fights. However, your main goal should be agro management. This can be frustrating because other classes can out-damage you, but unfortunately they cannot take the heat when they attract it. When your team mates draw agro from you and are attacked, it is your time to shine. Use Force Leap/Force Charge to get there quickly. It may also park the boss, but don’t count on it every time. Some are immune to stuns and interrupts. If it looks like you need to get more agro, follow the Force Leap/Force Charge with a Force Sweep/Smash to smack the boss and hopefully knock it off your ally and render your enemy prone. Then follow up with a Master Strike/Ravage to do lots of damage fast. This is a great way to pull that agro off your group reestablished it onto you. Be careful not to use these abilities prior to this as they will be on cool down and you will not have to tools you need to get agro back from the boss. If you find yourself chasing down bosses you might want to talk to your group. It might be a good idea to offer a friendly reminder to a group member who keeps pulling agro to slow down their attacks. It is important to learn to keep bosses in place so everyone’s abilities hit and are not wasted on a moving target. This also keeps those characters that can’t take the punishment safe. With combat in TOR being so fast and furious it is easy to get caught up in it. Keep a cool head with sound tactics and there will not be anything in the game you will not be able to tackle. A common MMO tactic that also works great in TOR is to let the tanks start the fight. 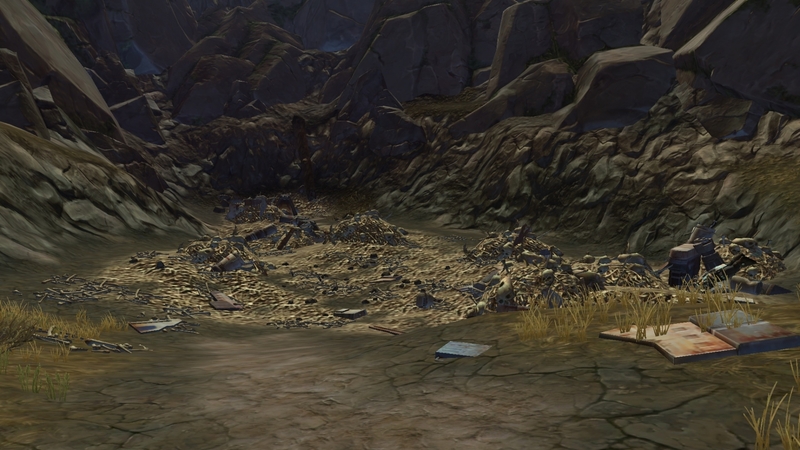 Allow the tanks a few moments to do damage, beat up the MoBs, and establish a good amount of agro. Then, once the boss is down 20% or so, the rest of the group can join in. There are other classes that can do more damage, faster, than a Jedi Knight or a Sith Warrior, but there are none that can take the damage like they can. 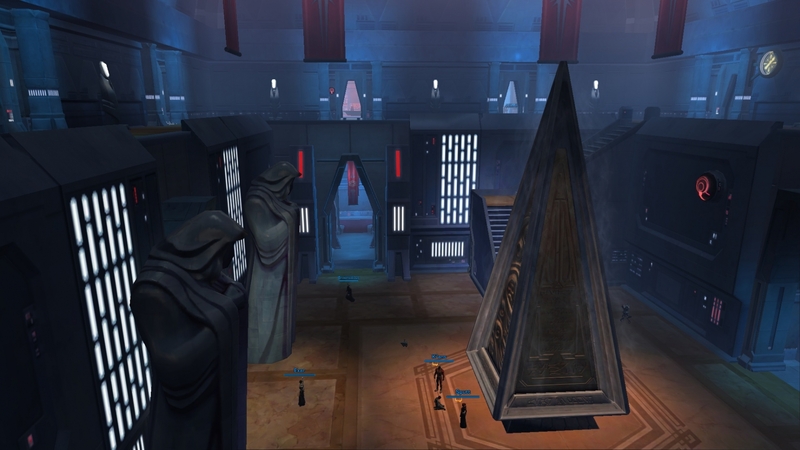 Overall the Jedi Knight and the Sith Warriors are great classes to play in TOR. They make excellent tanks and when they are well played, they can make a huge difference in even the toughest of missions. Through your first 10 levels, you should get a feel for which way you want to take your class when it is time to pick your path. Both offensive and defensive choices are great characters and will be needed classes for any end game content. The choice is ultimately yours, play what fits your style, your character and what you envision these to be. Below are a couple quick summaries to give you an idea what you will be looking for in TOR for advanced paths. 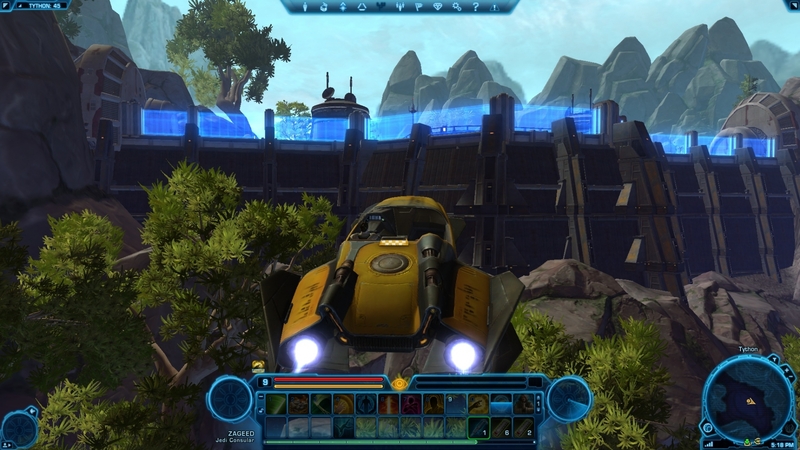 A wall between the good people of the Republic and their enemies, the Guardian stands firm in the face of overwhelming odds and dares opponents to attack. Control and focus are the hallmarks of the Sentinel. Through years of training the Sentinel learns the art of using two Lightsabers simultaneously to create an intricate web of damage that is almost impossible to evade. Entrusted with the task of destroying the Empire’s enemies, the dual-wielding Marauder embodies the teachings of Naga Sadow. Never hesitating, never faltering, there is no swifter bringer of pain in the galaxy. A stalwart defender of the Sith Empire, the Juggernaut embodies the teachings of Marka Ragnos, charging into enemies with heavy armor and pure rage. Enjoy playing these fun classes in TOR. Remember, once you choose a path, there is no going back, so choose carefully. Make sure you are certain what you want to do. Follow what you want to do with your character and consider your play style. Both classes are mirrors of each other, so pick the side that you think will fit your personality and role play style. You will have a lot more fun this way instead of trying to make a Sith act like a Jedi or vice versa. 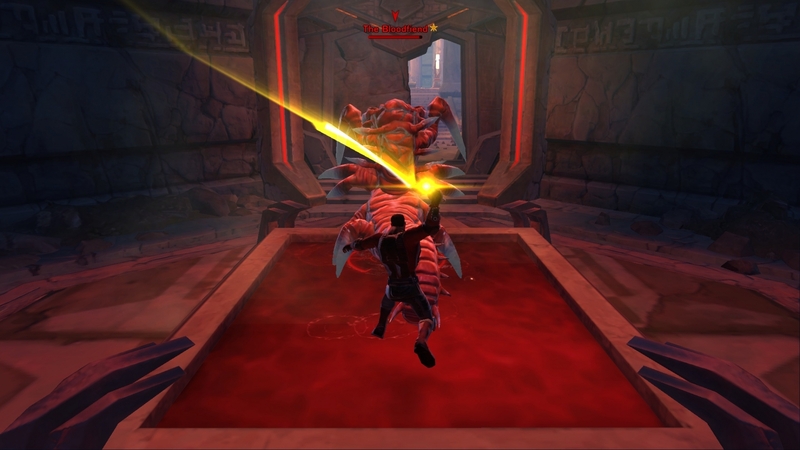 Grab your lightsabers, leap into battle and be ready to lead your group to victory in TOR! Ack, you’re right! Thanks for the heads up. I have the right table in there now. Oops! I checked the others and they look good. Let me know if you find anything else. I want to keep DDM’s Realm as up to date and accurate as possible.